An ailing tribal woman rests crouched on a bamboo bed, her husband sits by her side with his hand on her forehead. 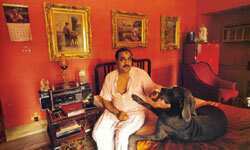 Facing this image is that of a Maharaja, sitting on his bed with his pet Great Dane; the walls of his bedroom, where ornate gold frames hang, are painted a shade of fiery red. Over the heap of ruins of a crumbled brick hut, a veiled old woman stands alone. Next to this image is a portrait of an affluent Sikh immigrant in front of his mansion in Glasgow. The works of photographer Prashant Panjiar are diverse and telling. For 25 years, he has been following wars, catastrophes and mundane life in rural and urban India with his camera, and has an oeuvre that covers every aspect of our country. Fifty-six of these images have made it to a book, King, Commoner, Citizen, edited by New Delhi-based curator Sanjeev Saith and Panjiar himself. The title aptly summarizes what Saith and Panjiar set out to do: Highlight thematic contrasts, and represent the complete arc of life in contemporary India. Panjiar has chronicled the lives of many surviving members of India’s royal families. In stark contrast to these images of lost decadence are those that capture the ugly side of Indian life—its poverty and suffering. And then there is the middle ground, of the ordinary citizen celebrating his or her ordinariness. “For someone with Panjiar’s experience, the whole country is a canvas. So, to put his works in perspective, juxtaposition is important. I have placed the images in such a way that the artistic grammar complements each other, but thematically, they represent contrasts," says Saith, who chose the 56 images from a few hundred that Panjiar first sifted out. But if you look closer, the contrasts go deeper. The commoner is often the one who is comfortable in his own skin, he has the joy and pride of a king while the king is aloof and uneasy. 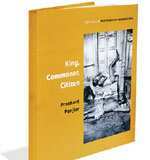 King, Commoner, Citizen is not impressive in scale; it is not the usual coffee table tome, but it is important because of the engaging, layered quality of the works.